What does true love look like once the honeymoon's over? Eight smoking-hot rugby players. Eight partners. Seventeen kids. Beaches and barbecues and beer, salt and sand and sea. Family and good mates and no worries. December in New Zealand. One very pregnant, very tired Hannah Montgomery Callahan is playing hostess to it all, doing her best and wondering if her best is good enough. And one legendary All Black captain is willing to do whatever it takes to show her that when he promised to be there for her forever, he meant it. Note: This book includes three steamy scenes. And they're good ones. 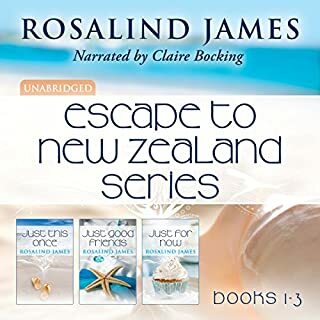 I am a HUGE fan of the Escape to New Zealand series, Rosalind James and Claire Bocking as a narrator. I feel this reunion book is a thank you note to her fans and Claire did a great job with all the different voices. 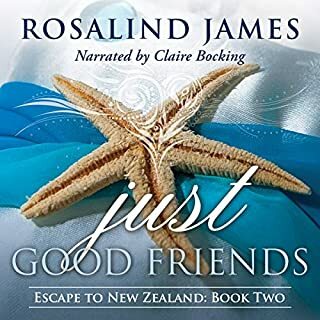 The All Blacks- old and new- are on December holiday and we catch up with old friends while they prepare for the wedding of Josie and Hugh from Just Not Mine. At the center of the action are Hannah and Drew (Just This Once Book #1) who are expecting their third child any day. One of the most touching chapters includes Drew urging Hannah, with the help of his extended rugby family, to accept help with the household duties especially when she returns to work. The characters comments are engaging, and somewhat poignant. There are steamy scenes with buff men in new places and with pregnant bellies involved. Some of the discourse is about making your pregnant woman feel special. James did a nice job of describing a man's love (and lust) for his pregnant wife. Thank you for that Ms. Rosalind. It is a trip down memory lane for Hannah and Drew and I highly recommend it for lovers of the series. If you haven't heard the first books I would not recommend you start with this one. Save it, do the others first and then crack this one open. Catch up with the Escape to New Zealand families! First off, this book could possibly be listened to by itself BUT the reader would probably feel like they're not completely "in" on everything since it involves history laid in the 1st six books. If a story based around rugby, more specifically the provincial,super and All Blacks teams interests you, this could be the series for you to explore. Now having said that AND having read the other books . . . it was good to "b" able to Escape to New Zealand once again. The play on the "b" is because of the background, believability, babies/pregnancies, brotherhood, bonding, beaches, bedrooms, backseats, and beginnings. It was fantastic to have details of situations from past books be filled in to really round out the stories. The book also makes the characters even more endearing because their insecurities and feelings of being "less than perfect" are revealed and dealt with in a very realistic manner. Pregnancy and babies are handled in a broad spectrum--from the issue of not being able to have biological children to should we have more to holy smokes, what have we really done & how are we going to manage another child? The interweaving of the lives of fictitious past and present All Blacks gives possible insight into the issues they might really have to deal with. The book helps to forge new bonds and strengthen old ones. 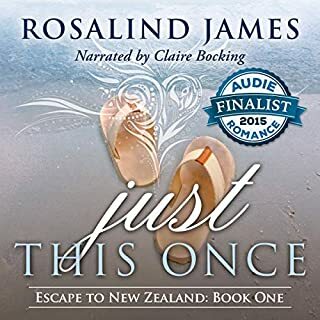 Obviously the beach is going to factor into a book that is set in New Zealand in December--both in the bonding and "steamy" factor. Speaking of steamy . . . in addition to the beach, there's also bedroom and backseat happenings as well. As for the beginnings--so many to witness. From a wedding to a newly engaged couple to the growth of families. Can't wait to see how these evolve in future Escape to New Zealand installments! As for the narration, I have to say that Claire Bocking really brought great stories to life once more and has reached a new level of phenomenal for several reasons. 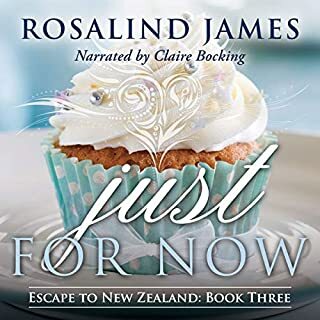 Her Kiwi accent is spot on and she seamlessly switches from narrator mode (her own voice) to Kiwi characters (including Paheka and Maori) to American characters. Not only that, she does a marvelous job of giving close to 20 individual characters their own voice and you can clearly tell who's "talking" even with out the prompting text/bits. We're talking a range from toddlers to young children to older children to teens to young adults to older adults. Once again, she emotes the narration and character speech with sincerity and believability. I found myself laughing, sighing, groaning and even crying because of the emotion she brings to the story. I just can't imagine anyone else doing the narration for this series of books and being so successful at it. Now for the legal bit . . .I received a free copy of this book in exchange for an honest review. I was not compensated for my review, and I was not required to write a positive review. The opinion expressed here is my own. If you look at my reviews here, one Amazon and Good Reads you will find that I don't always leave a 5 star review. BTW--I would have gladly purchased this audio book with my own funds/credits. Narrator Claire Bocking rocks this book! 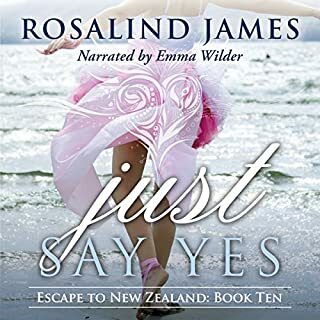 This book is really an epilogue to the first six "Escape to New Zealand" books by Rosalind James. It does not stand alone due to the background of the characters and does not have a strong plot. However, for Escape fans, this is a fun follow-up to the original stories and I recommend it for those who have read or listened to the other books only. 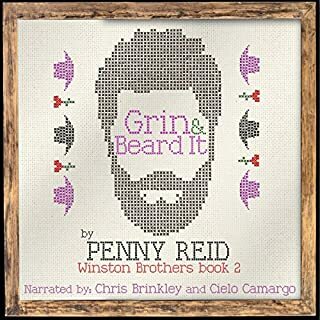 The narration carries this audiobook the entire way. The plot itself is kind of...boring, but it is enjoyable just to listen to Claire voice the various characters. I love the accents and the kids, so for me, it's along the lines of easy listening music. Near the end, when Hannah is giving birth, I was literally laughing and crying and thought I was going to barf all at once. Claire is that good. You can't listen without being affected. Great written story, fantastic reading. Bocking and James are a great combination. 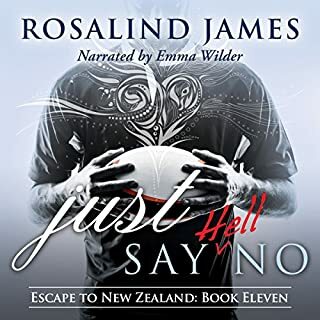 James writes a believable rugby romance story and dialog involving the married All Blacks and Bocking's narrative pulls you into their world so well you quickly forget about the person reading the story. I highly recommend this story. This is a great book! Part of the reason I loved it so much is because it is like a reunion of all the characters I came to love in the previous books in the series. I love knowing more of their stories and what has happened in their lives since the other books left off. (I sometimes get very attached!) And boy, have they been busy! :) Everyone is gathering for the wedding of Josie & Hugh, and with 8 couples (some of whom are pregnant) and 17 kids, you know things are going to stay interesting. It definitely made me both laugh & cry. But the other part I love is the writing. Rosalind has such a great writing style and is so descriptive that her books are always a pleasure to read. And this book is no exception. Like the other books, you will have no problems seeing the sights she is describing. As with the others, Claire does a great job narrating, so despite there being so many characters, I never once got lost or confused as to who was speaking. Totally seamless. 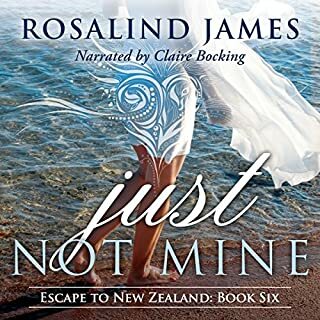 Just a little FYI-this is part of a series (Escape to New Zealand), but could be read as a standalone. However, it won't be quite the same without having read the others in the series, so I highly recommend doing so. You won't regret it! Also, this is not quite as 'rugby romance' as the others in the series, but it's still a definitive element. There is more of what their lives are like off the field, but still dealing with the fame of being an All Black. If you could sum up Just Once More in three words, what would they be? What other book might you compare Just Once More to and why? 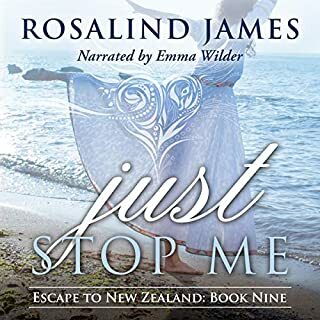 The only thing you can compare Rosalind James books to are her other books. They're all great and very original. Her accent! She's so great with the kiwi and american accents and keeping all the characters distinct. It's like the Love Actually of Rugby Romances. Except no heartbreak. I received a free copy of this book in exchange for an honest review. The opinion expressed is my own and I was not obligated to give a positive review.That being said, there is nothing negative about this book. You get to catch up with all your favorite characters with sweet, steamy scenes thrown in. You see what it's like when your favorite couple goes from courtship to years (and several kids) into their marriage. You also get to see different couples in different stages of their relationships. It was nice to hear about the characters again and the length was perfect. It was a nice update without being the length of a full book, even though i would have read that one too. James and Bocking make a great team. For fans of the series, I would say this is a must-listen/read. Even though the central characters of the book are Hannah and Drew, James spreads the narrative to other characters so you really get an update on everyone, and in some cases, an expansion of events in and between previous books. There are several steamy scenes in this book and several sweet ones, and something for everyone who is a fan of the series. I would say Hannah and Drew, Kate and Koti, Finn and Jenna, Reka and Hemi, and Hugh and Josie fans in particular will not be disappointed. As someone who has never been through a pregnancy, I would also add, I think for those who have will get additional pleasure/reader solidarity from reading about some of the pregnant characters. I think it is best for the reader going into his book knowing that this is a book about established characters in established relationships, with quite a bit of talk about pregnancy and childrearing and not, like the rest of the series, focused on the courtship phase of a relationship. Claire Bocking really outdoes herself in this book, and you can really hear all the different voices for each character. Each character is distinct, and I never had to go back in the audiobook to try to figure out who was who, as her voice acting and the writing made that very clear. 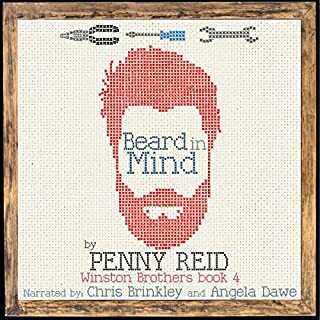 If you have listened to previous audiobooks in this series, it is a fun listening experience revisiting the different character voices. 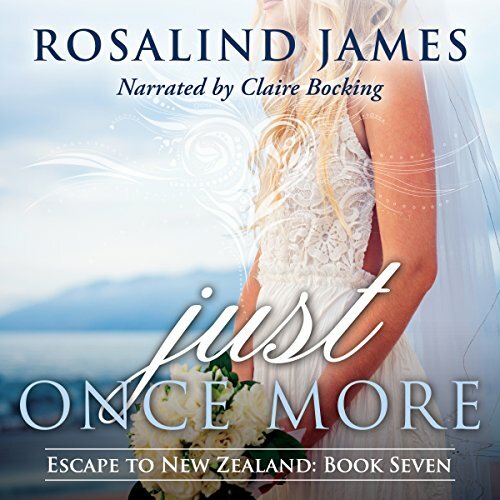 Even as a long time reader of series out of order, I do not recommend that you start the Escape to New Zealand series by reading Just Once More. Any of the other books can be read as a standalone, but not this one. The more of the rest of the series you have read. The more you will enjoy this book as it includes all of the couples in the previous books and expands on what happens in those books and allows the reader to return to some favorite characters. Absolutely AMAZING!!! I LOVED this book! The first book in the series and now this book are officially my faves! It is so amazing that all the characters were brought together and we see them progressing in life, love, and everything else. Definitely the change up the series needed! THANK YOU ROSALIND! Please never stop writing escape to New Zealand books. You're amazing and the narration is stunning as well! Seriously if Claire does all of the voices on her own I'm incredibly impressed. Each character has their own special voice and the male characters and accents are spot on and don't sound like a female pretending to be a male. Love, love, love. There is not one negative thing I could imagine to say about this book. I am anxious to listen to the next one!! Would you listen to Just Once More again? Why? Yes! I love the story & Claire was amazing with the narration. What was one of the most memorable moments of Just Once More? How Drew and Hannah and Finn and Jenna got engaged. Yes I have and this by far, was her best work! All of the times that Drew was reassuring Hannah how much he loves her and of course, the ending between them. It was such a heartwarming story of the lives of these wonderful characters after our initial encounter with them. It was great to read/listen where they are in their lives. It was also entertaining to see them all interact with one another as a collective group. I, of course, enjoyed reading more about Drew & Hannah and Finn & Jenna as they were my favorite characters. I loved the ending, of which I do not want to give any spoilers! But it was so appropriate for the ending of the book. 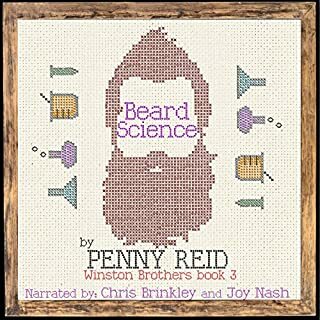 A must read/listen, as all of the New Zealand books are!! Claire did an AMAZING job! I don't know how she does all of those voices, but wow - she gives everyone a fantastic voice! I received a free copy of this book in exchange for an honest review. I was not compensated for my review, nor was I required to write a positive review. The opinion expressed here is my own. What made the experience of listening to Just Once More the most enjoyable? 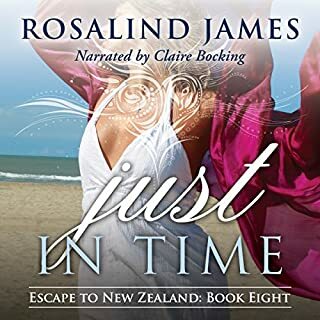 Between the wonderful story about characters met in previous rugby romance books by Rosalind James and the amazing voice of Claire Bocking, this was a wonderful experience. Romance is remembering is what the character, Reka, says at one point in the story and nothing is truer about this book. 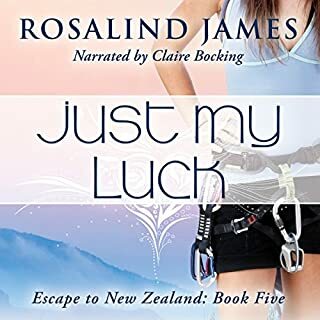 It brings together all the characters from Ms. James romance rugby series, Escape to New Zealand, from Drew and Hannah to Hugh and Josie. At times funny, heartwarming, steamy, and downright teary, it is a wonderful story. Claire Bocking is amazing . She somehow brings every character to life, whether male or female or young or old, they all come alive with her performance. She makes it seem as though you are right in the midst of their lives. You can feel the emotion and experience the moments. I think it would be what the character Reka says, that romance is remembering. Because Ms James not only brings us up to date in the character's lives, she also helps us remember what brought them together and the depth of their ongoing love. I would definitely commend this Audible book to everyone. It is an uplifting, enjoyable read. I received a free copy of this book in exchange for an honest review. I was not compensated for my review and I was not required to write a positive review. The opinion expressed here is my own.